This guide will walk you through every step of basement organization. It will answer all your questions, so be ready to get organized! Basements tend to be just as disorganized as garages. It’s easy to see why. If you don’t use your basement, it can become a place you just throw things, hoping to forget about them. But too much stuff can be a fire hazard. It can also cover up – and even destroy – the few things you care about and want to keep. Are you ready to completely revamp and organize your basement? Then let’s get busy. The first step is to make some decisions. Decide the purpose and function of your basement. Do you want this to be a family room, where your family spends time together? Or will it be an organized storage area? Set the goal and go for it. This one decision will motivate and drive you as you work through the piles of stuff. It will also keep you focused. It’s easy to become overwhelmed, so keep your goal in mind. Next, create sections of the basement and work your way around them. If you are hoping to (or already do) enjoy spending time in the basement, establish a storage area away from the the living area. You can even use furniture and rugs to create a visually sectioned off place that is separated from the rest of the basement. Before you even begin sorting through your stuff, you need to make sure you have sturdy shelves. Basements are notorious for being a place moisture leaks in. So you need sturdy shelves that can hold your tubs off the ground. For safety reasons, make sure the shelves will not fall over easily – especially if you have kids. The above before and after picture from Instagram shows the transformative power of shelves. It’s so much easier to sort and store your stuff when you have shelves for all the tubs. How do you build your own shelves? Follow this tutorial. It takes you through every step, and the shelves are incredibly strong too! Now that you have your basement organized into sections, let’s get some organization ideas for them. There are a ton of genius basement organization hacks out there. Here are some of the best ones. If you have a really large basement or need to use your basement for different purposes, use a room divider to section them off. A room divider will create a safe traffic flow in case of an emergency, while also creating a visual division of the really large area. This is a great tip if you want to hide your storage shelves from the family room, without investing in new closets. This hack from Renting Out Rooms shows how to turn a sliding door into a wall partition. There are lots of racks and solutions for using your ceiling as storage. You might typically find these overhead racks in garages, but they work perfectly fine in basements too. The space under the stairs is the perfect place for storage, and there are lots of hacks and ideas online that show you how to use it best. The Shelterness website has 5 basement under stairs storage ideas. You can go as involved as built in units, or as easy as using tubs and shelves. The main thing to remember with under-stair storage is to keep things in separate bins. If you start shoving piles of stuff under the stairs you will risk hurting your stuff and not finding what you need. If you have space in the ceiling of your stairwell, add a few shelves and baskets. This is perfect for seasonal things like winter gloves, summer sunscreen, or even board games. Look around for other spaces in the basement that either aren’t being used, or could be used smarter. In fact, the site Digs Digs has a fantastic list of ideas just like this. Use a hanging organizer to store things that you need to access quickly. If you don’t have a closet, you can attach a towel rack to your wall and use it for hangers. Or, attach hanging organizers to horizontal bars from your ceiling. Now that you have some ideas for how you are going to store your stuff, here are some valuable tips to keep in mind as you work. Use them so you don’t get overwhelmed as you sort through all your stuff. The end goal is worth all the effort. These ideas will make the huge job a lot easier. You can certainly use all the same types of plastic tubs and just label them. Lots of people do this. It creates a seamless look. However, don’t be afraid to branch out and use different types of containers throughout your basement. Sometimes, an open bucket without a lid is better for things that you use frequently. Here are a few ideas of storage containers and how to use them best. Wooden crates – Since these have slats, these are perfect for things you don’t need to protect from the elements. Think plastic kids’ toys, tools, etc. Labeled buckets – These don’t have tops and aren’t stackable. So use them near the stairs or doorway for things you use frequently, such as sidewalk chalk, hats and gloves, and bug spray. Plastic tubs – These are multipurpose and can be used for everything you own. Lids make them stackable and they protect your stuff from the elements. If you have some things that don’t exactly fit in a tub or basket, consider hanging it on the wall or securing it to the wall somehow. This applies to things like yard tools and even musical instruments like guitars. If you were counting on using your walls for shelves, try to find a way to put shelves in the middle of the basement too. Sometimes securing things to the wall is the best way to keep them from falling over and creating a hazardous situation. Finally, keep it looking fantastic so you can see the beauty around you. Actually seeing progress will motivate you to keep going. If you have an unfinished basement, you can add a simple rug and curtains for a new look. This might sound like an obvious suggestion, but this will also prevent your basement from becoming a dumping ground in the future. If you need to put something in the basement, decide right then where it is going to live. Once you make the decision to stop dumping things into your basement, it will stop becoming a catchall. Let’s get that basement organized. If you follow every step here, you’ll go from chaos to complete organization. First, you need a place to go through it all. If your basement is so overrun with stuff that you can’t walk, throw away as much as you can so you can have a place to sort. Put a plastic tarp down so that as you empty bags and boxes you can just roll up all the small pieces that fall out. The second step will take the longest, but it’s the most important – get rid of anything you can. Understand how much space you have. If you don’t have room to keep everything you own, you need to let some things go. If you find something that is sentimental but you don’t have room for it, take a picture of it before letting it go. Then, keep the picture in a photo album. Did you know there is a right way to throw stuff away? Check your local trash rules for the correct way to dispose of hazardous materials. If you have a broken piece of furniture, you might be able to break it apart and put it in your trash can for pickup. Consider renting a large dumpster for your driveway. These are large dumpsters and your payment covers the company taking them away to the landfill for you. 1-800-GOT-JUNK – This is a company that will bring a dump truck and a team of workers. They will fill the truck with your stuff. You might have seen their work on the show Hoarders. Waste Management Bagster Bags – You can buy these bags at home improvement box stores like Lowes and Home Depot. Then, after they are filled, you schedule and pay for Waste Management to come pick up the bag. Local Dumpsters For Rent – Most areas have a company with a dumpster for rent. Be careful with this option since some dumpsters are extremely pricy and might even scratch your driveway. There are lots of places to donate your gently used things. But some of the stuff you are donating might be better for some organizations than others. These are the best places to donate the things you don’t need anymore. Salvation Army – They accept gently used clothing, children’s toys, books, and some furniture. Check with your local chapter to see what they need. Goodwill – Goodwill is one of the most popular thrift stores in the nation. They accept the same things as the Salvation Army. ReStore – ReStore is from Habitat for Humanity. They will accept home decor, tools – anything for homes. Book Donations – This is a thorough list of where to donate your used books. As you are going through all your stuff, consider recycling some of it too. Check with your local area for recycling centers and see if they offer a pick up service. Selling things second-hand is a lot more difficult (and takes longer) than simply donating them. So make sure you have the room to store your stuff while you wait for someone to buy it. Keep in mind: if something doesn’t sell, don’t keep it. It might not be worth what you thought. The third step is to label everything as you sort. When you designate a tub or basket for a purpose, label it right away. Labeling as you go will speed up the sorting process. You won’t have to look through the tub to see what’s in it. There are lots of beautiful printable labels online. The final step is to make sure all your tubs are organized in a logical way. Now that you got rid of stuff you don’t need, what you have left is everything you will use or is important to you. Alphabetically – It might work best to alphabetize your tubs within each category. By Season – Create sections for each of the 4 seasons and then organize each season by item type (decor, clothes, tools). By Category – Or you could organize generally by category, like home decor, tools, books, and clothes. Whether you have a finished or unfinished basement, consider adding storage closets with closet systems. These will look stunning in your basement and provide extra protection from the elements. Keep in mind that closets take up more space. So if you have a very small unfinished basement, you might be better off just using wall shelves. The beautiful thing about having an unfinished basement is how much possibility there is. It is literally a blank canvas, ready to be filled. The first thing you need to do is get some kind of carpet remnant or rug for the floor. You’ll be more likely to keep your basement organized if you are comfortable spending time there. When you have an unfinished basement, you probably aren’t using it as a game or living area. So feel free to create aisles like a store, with lots of sturdy shelves. There you have it! 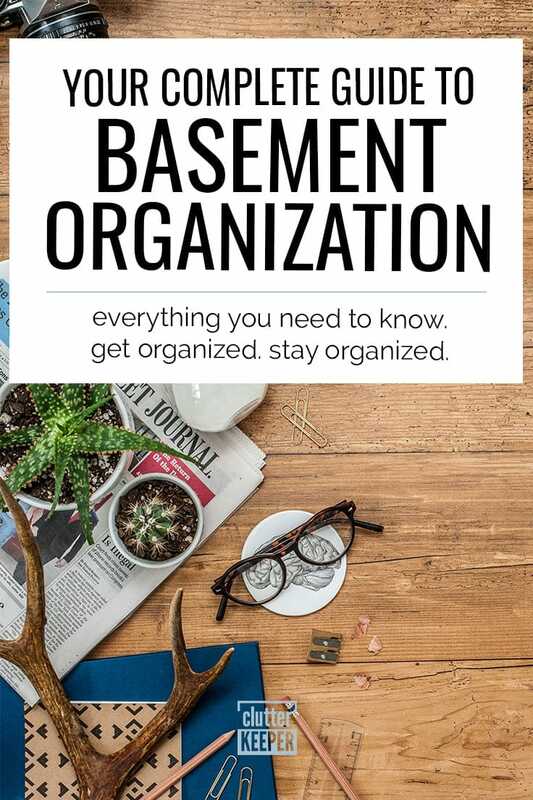 This is everything you need to know to completely organize your basement. This basement organization guide provides the information, now it is up to you to put in the work. Remember: an organized space is worth all the effort. You deserve it! Now that you have a completely organized basement, are you ready to tackle more rooms? Here are some other home organization guides that walk you through the process.